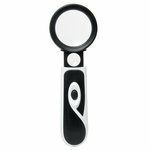 Versatile magnifier with one, two or three lenses; can be used alone or in combination with two or three lens models to increase magnifying power in several times. 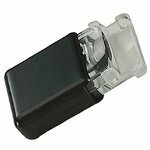 Glass lens with hinged stainless cover for very small objects, collection, and jewellery work. 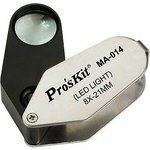 Optical quality lighted magnifier with 2-1/2" square lens. Lens material: glass. 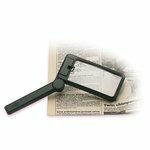 A compact folding magnifier with 4" handle and backlight. 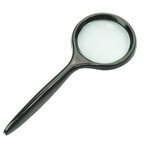 Magnification: 2x and 4x. 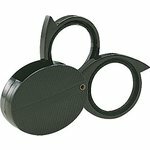 Magnifier consists of upper and lower 3X lenses slide one out to obtain 3X magnification and slide the other out to obtain 6X magnification. 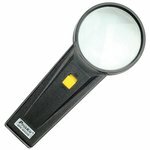 Handheld LED light magnifier with 10D(3.5X) / 76D (20X) magnification. Power supply: 3 AAA batteries. 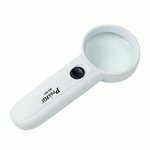 Handheld magnifying glass (3.5x) with LED light.